NYC is Blue: Play Fantasy Football for NYCFC Prizes! 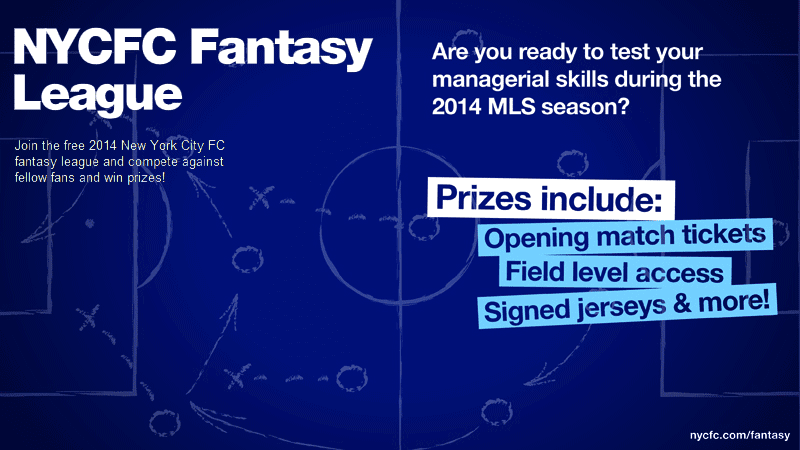 Yesterday, New York City FC announced its Fantasy Football contest for the 2014 MLS season. Join the free 2014 New York City FC fantasy league and compete against fellow fans and win prizes! MLSsoccer.com is back with the 2014 version of MLS Fantasy Soccer Manager. Your task is to piece together the best possible roster while staying under the salary cap. Four (4) tickets to the New York City FC home opener and field level access for warm-ups. Two (2) tickets to the New York City FC home opener and a team signed jersey. Inaugural New York City FC jersey. Click the "Start Playing" button and log in with a social network or through your MLS Network account. Follow the directions on the MLS Fantasy Website to pick the players for your team. Be sure to name your team and, in order to enter the Contest, you must select "New York City FC" as your "Favorite Club". Interesting. I love even the talk of official jerseys; it seems so far away. And, just as an aside, the team's graphic up top is both an example of how great multiple shades of blue can be in branding the club and (hopefully) another hint that they'll keep the launch colors. The MLS website is a little confusing; if you haven't registered with them before, you have to sign up. At that point, they ask you to set a favorite club, but NYCFC isn't listed. NYCFC is an option when you edit your profile, and when you select your fantasy team. So don't worry, you can choose "No Preference" when registering and still enter into the NYCFC contest. The contest is clever; they're piggybacking on the official MLS fantasy football site, just adding prizes specific to the club. I like it. ELIGIBILITY: MLS Fantasy Soccer Manager (http://fantasy.mlssoccer.com/) is open to legal residents of the United States of America. The New York City FC MLS Fantasy Manager Contest (the "Contest") is open to people who reside within a seventy-five (75) mile radius of New York, NY, who are eighteen (18) years or older as of the date of entry. Employees, officers, and directors (including immediate family members (spouses, parents, children and siblings and their respective spouses, regardless of where they reside) and members of the same household, whether or not related) of New York City FC (the "Sponsor"), Major League Soccer, L.L.C. ("MLS"), and Soccer United Marketing, LLC ("SUM") (collectively, with Sponsor and MLS, the "MLS Entities") and each of their respective parents, affiliated companies, subsidiaries, licensees, distributors, dealers, retailers, printers and advertising and promotion agencies, and any and all other companies associated with the Contest are not eligible to participate or win a prize. The Contest is subject to all applicable federal, state, and local laws, rules and regulations. Void outside United States of America, and where prohibited or restricted by law, rule or regulation. HOW TO ENTER: The Contest begins on February 28, 2014 and ends on October 26, 2014 ("Entry Period"). During the Entry Period, there is one (1) way to enter: online. No other method of entry will be accepted. Limit one (1) entry per person, per e-mail address and per household, regardless of method of entry. Multiple entries received from any person or e-mail address or household in excess of the stated limitation will be void. WINNERS: The top ten Entries (i.e., the ten entries in the New York City FC Supporters Club that score the most points) will be selected as winners of the Contest (each a "Winner" and collectively, the "Winners"). The decisions of Sponsor are final and binding on all matters relating to this Contest. Odds of winning depend on the total number of eligible entries received. Limit one (1) prize per person, family and per household. So limited to adults in the New York City area. Sorry, Manchester. I've never played fantasy football in my life, either this kind or Gridiron ball. But I'm picking my players now. If I can't get the actual club nicknamed "Pigeons", at least I can name my own.